Contact at (313) 579-1869. All vehicles are sold “as is”, and can be viewed from 8AM on the day of the sale. There are no warranties, and auctions begin promptly at 9AM. You must have cash at the time of sale, and most bids start at $450. We offer a great variety of vehicles including Ford, Mercury, Chevy, Buick, Pontiac, and many other fine manufacturers! 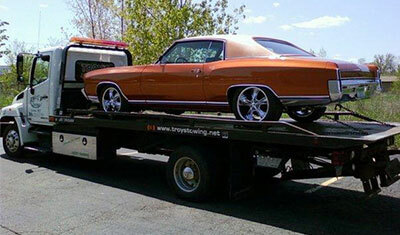 Troy's Towing is always here to help our fellow motorists. We specialize in some of the lowest prices, and focus on the safety of all our valued customers and their vehicles! So if you're having vehicle problems and need your vehicle towed to a body shop or a dealership, it's our privilege to jump into action on your behalf. It's easy to count on the Troy's Towing team, because we provide experienced, professional drivers, and a state-of-the-art fleet that features damage-free towing technology. So if you're ever stranded, call on Troy's Towing...we'll get you going again!